If you do not want to receive this newsletter, you can unsubscribe by clicking on the link at the bottom of this email. April 3-4, 2019 Board of Retirement Meeting Agendas available 3-28-2019. 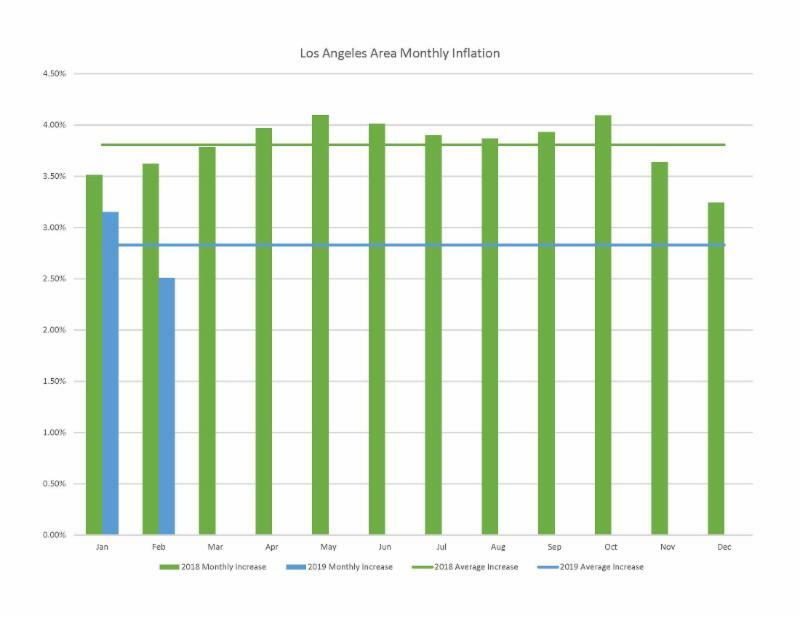 For February 2019, Los Angeles Area Inflation (year over year) was 2.51%. ﻿Click HERE or on the chart to see monthly inflation figures compared to last year. Want to track the COLA on your own? On the 15th of each month, the U.S. Department of Labor, Bureau of Labor statistics releases CPI data for Los Angeles. Click HERE to read the current Bureau of Labor Statistics report. The Total Fund returned 1.24% for the month of February. Since the fiscal year beginning July 1, 2018, the portfolio has returned 3.22%, generating over $95 million for our beneficiaries. 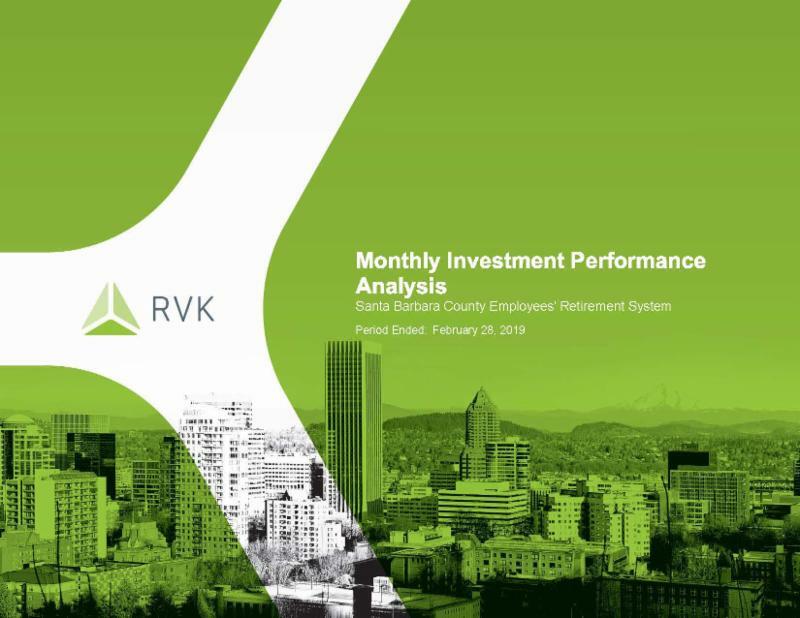 Click Here to Read the Full February 2019 Investment Flash Report! The next Operations Committee meeting will be held on April 3, 2019. The Board of Retirement also approved the 2019 COLA. All Legacy General and Safety Plans will receive 3% increase, 1% COLA carry-over bank. Retired members in Plan 7 and Plan 8 will receive 2% increase, 2% carry-over bank. Plan 2 member do not receive a COLA. The minutes for the February 27, 2019 Regular meeting will be available online on Thursday, March 28 HERE . The next Regular Board of Retirement meeting is on April 3, 2019 and the Board Retreat is on April 4, 2019. The agendas will be available online on Thursday, March 28. Click HERE to access the Board Materials on our website. Want help with your Health Care Inquiries and Concerns? ﻿Looking for a stress-free solution to your healthcare inquiries and, or concerns?CareCounsel is our health advocacy partner and is a service offered as part of your benefit package. CareCounsel works independently from your insurance carrier and is a completely confidential resource. It’s easy, call: (888-227-3334), or email: staff@carecounsel.com Monday through Friday 6:30 am to 5:00 pm PST. After hours, you can leave a message and they will get back to you the next business day. ﻿RESBC is a non-profit organization dedicated to improving the lives of county retirees by providing information on critical retirement issues and offering educational/cultural social opportunities. Membership in RESBC is $2.50 monthly. Dues are deducted from the member’s Santa Barbara County pension payment. County employees may join RESBC by completing the RESBC Membership Deduction Authorization form at the time of their retirement exit conference. Retirees may join at any time by requesting a membership form from SBCERS, 3916 State Street, Suite 100 Santa Barbara, CA 93105, 1-877-568-2940 or, by clicking here and sending the completed form to benefits@sbcers.org. Have a question about an item in this newsletter? ﻿Call a Benefit Representative at 1-877-568-2940. We are ready to help you! Want to look at prior Newsletters? ﻿Click here to visit the SBCERS Newsletter Archive.